The Building Energy Data Exchange Specification (BEDES) facilitates the exchange of information on building characteristics and energy use. It is intended to be used in tools and activities that help stakeholders make energy efficiency investment decisions, track building performance, and implement energy efficiency policies and programs. 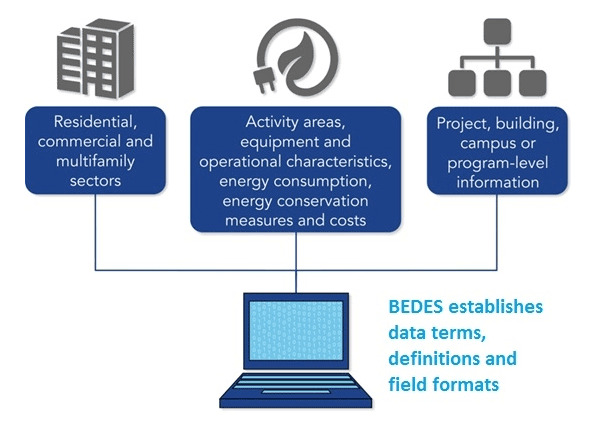 BEDES has been developed by Lawrence Berkeley National Laboratory (Berkeley Lab), with the help of the many stakeholders of the BEDES Working Groups, and funded by the U.S. Department of Energy (DOE). More information about the vision, goals and future plans of BEDES is available on the Department of Energy BEDES website. We encourage all stakeholders to participate in the continued development and adoption of BEDES, and to provide feedback as BEDES is updated.